Japanese digital art collective teamLab has a large scale exhibition entitled DMM.PLANETS at Odaiba, Tokyo that invites participants of all ages to immerse themselves in multi-room environments showcasing digital works. The infinity rooms allows viewers to use their smartphones to interact and add elements to the digital works to create an ever-changing display of art. teamLab is known for app-driven interactive artworks that allows users to add and manipulate elements to wall projections and light sculptures. The works are rendered in real time by a computer program and are not pre-recorded or looped which creates a visual experience that is unique to every visitor. On view at Odaiba Aomi area through August 31. 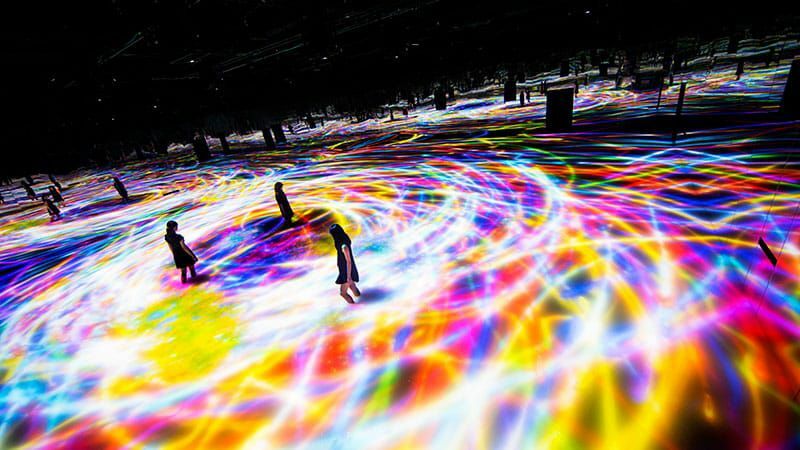 Japanese digital art collective teamLab has a large scale exhibition entitled DMM.PLANETS at Odaiba, Tokyo that invites participants of all ages to immerse themselves in multi-room environments showcasing digital works.